This means that what man images, sooner or later externalizes in his affairs. I know of a man who feared a certain disease. It was a very rare disease and difficult to get, but he pictured it continually and read about it until it manifested in his body, and he died, the victim of distorted imagiation. So we see, to play successfully the game of life, we must train the imaging faculty. A person with an imaging faculty trained to image only good, brings into his life "every righteous desire of his heart" -- health, wealth, love, friends, perfect self-expression, his highest ideals. The imagination has been called, "The Scissors of The Mind, " and it is ever cutting, cutting, day by day, the pictures man sees there, and sooner or later he meets his own creations in his outer world. To train the imagination successfully, man must understand the workings of his mind. The Greeks said: "Know Thyself." I added, "If A. B. is the right man you can't lose him, and if he isn't, you will receive his equivalent." She saw A. B. frequently but no headway was made in their friendship. One evening she called, and said, "Do you know, for the last week, A. B. hasn't seemed so wonderful to me." I replied, "Maybe he is not the divine selection -- another man may be the right one." Soon after that, she met another man who fell in love with her at once, and who said she was his ideal. In fact, he said all the things that she had always wished A. B. would say to her. For example: A woman once asked me why her life was now one of poverty of limitation. Formerly she had a home, was surrounded by beautiful things and had plenty of money. We found she had often tired of the management of her home, and had said repeatedly, "I'm sick and tired of things -- I wish I lived in a trunk," and she added: "Today I am living in that trunk." She had spoken herself into a trunk. The subconscious mind has no sense of humor and people often joke themselves into unhappy experiences. For example: A woman who had a great deal of money, joked continually about "getting ready for the poorhouse." For example: A woman came to me one hot summer's day for a "treatment" for prosperity. She was worn out, dejected and discouraged. She said she possessed just eight dollars in the world. I said, "Good, we'll bless the eight dollars and multiply them as Jesus Christ multiplied the loaves and the fishes," for He taught that every man had the power to bless and to multiply, to heal and to prosper. She said, "What shall I do next?" I replied, "Follow intuition. Have you a 'hunch' to do anything, or to go anywhere?" Intuition means, intuition, or to be taught from within. It is man's unerring guide, and I will deal more fully with its laws in a following chapter. The woman replied: "I don't know -- I seem to have a 'hunch' to go home; I've just enough money for carfare." Her home was in a distant city and was one of lack and limitation, and the reasoning mind (or intellect) would have said: "Stay in New York and get work and make some money." I replied, "Then go home-never violate a hunch." I spoke the following words for her: "Infinite Spirit open the way for great abundance for -- --. She is an irresistible magnet for all that belongs to her by divine right." I told her to repeat it continually also. She left for home immediately. In calling on a woman one day, she linked up with an old friend of her family. I will explain more fully in a following chapter the scientific reason for this and how fear must be erased from the consciousness. It is man's only enemy -- fear of lack, fear of failure, fear of sickness, fear of loss and a feeling of insecurity on some plane. Jesus Christ said: "Why are ye fearful, oh ye of little faith?" (Mat. 8:26.) So we can see we must substitute faith for fear, for fear is only inverted faith; it is faith in evil instead of good. The object of the game of life is to see clearly one's good and to obliterate all mental pictures of evil. This must be done by impressing the subconscious mind with a realization of good. A very brilliant man, who has attained great success, told me he had suddenly erased all fear from his consciousness by reading a sign which hung in a room. He saw printed, in large letters this statement -- "Why worry, it will probably never happen." These words were stamped indelibly upon his subconscious mind, and he has now a firm conviction that only good can come into his life, therefore only good can manifest. In the following chapter I will deal with the different methods of impressing the subconscious mind. It is man's faithful servant but one must be careful to give it the right orders. Man has ever a silent listener at his side -- his subconscious mind. Speak these words aloud, with power and conviction: "I now smash and demolish (by my spoken word) every untrue record in my subconscious mind. They shall return to the dust-heap of their native nothingness, for they came from my own vain imaginings. I now make my perfect records through the Christ within -- The records of Health, Wealth, Love and perfect self-Expression." This is the square of life, The Game completed. "Death and Life are in the power of the tongue." 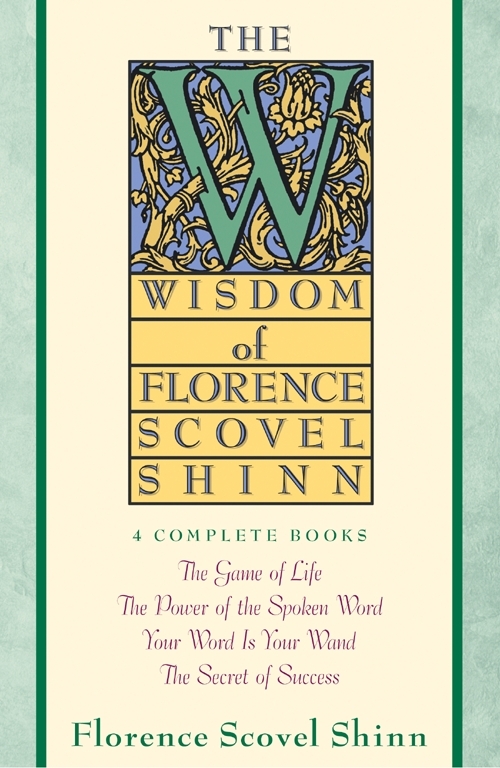 Emmet Fox on Florence Scovel Shinn One secret of her success was that she was always herself...colloquial, informal, friendly, and humorous. She herself was very spiritual...and taught by familiar, practical, and everyday examples.